If you have been following my blog and newsletters for a while, you may already know that I believe in the universe. 🙂 I believe it is listening to us everyday and conspiring to deliver what our heart desires, which is a beautiful balance between what we want and what we need. My life is full of stories from the universe, of serendipitous meetings, decisions and chance encounters which have led me down this amazing path so far. This is why I am so passionate about my signature ecourse: ‘Big Dreams, Small Wonders‘ (now it in it’s 7th year!) as I know how powerful we can be when we trust in this process. If you are craving a different life or want to invite new opportunities in, you already know in your heart, there is a better life waiting for you. And I can promise you, there is, if you desire it and trust it will happen. I guess you can say I am living proof of this process as I have used all the tools and techniques from this ecourse in my own life since 2010. 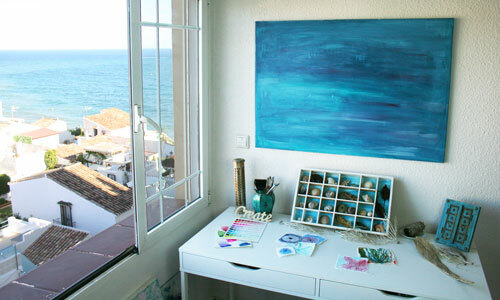 It has led me to my dream home, creative life and business by the sea here in Spain and to enjoy life as fully as possible as I set new goals each year. So, this is my heartfelt invitation to you to join me in this 6 week ecourse when I run it live in January so we can go through the program together for 2017. You can work through at your own pace if you prefer and you also have lifetime access so you can always return to dive deeper and deeper for years to come. Registration for the 2017 session of ‘Big Dreams, Small Wonders!‘ is OPEN! Join me to create your amazing 2017 and beyond. Classroom opens on Monday 26 December and the LIVE class begins on Monday 2 January with lifetime access so you can work through at your own pace and return for years to come. 50% off the regular price. 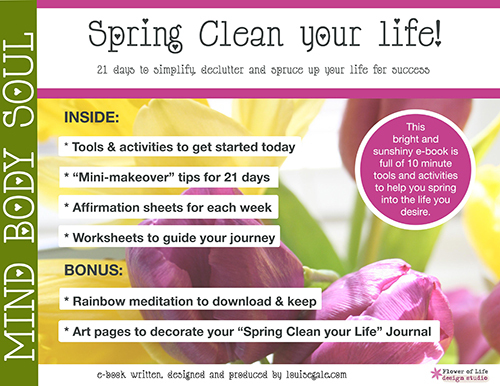 The “Spring Clean Your Life” ebook is perfect for any time of the year to dust off your own cobwebs and clear some space to invite exciting new possibilities in. Your ebook will be emailed to you within 24 hours of your ecourse purchase. Free ebook offer runs out 11.59pm EST on 1 December. For a limited time only, I am also offering my 2017 Big Dreams, Small Wonders Workbook & Planner FREE. Sign up HERE to get instant access!